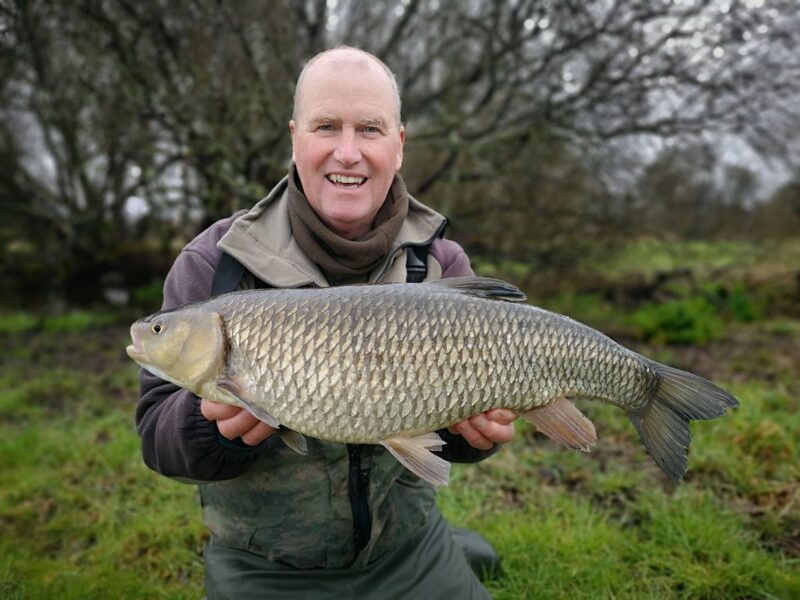 I was delighted at catching no 17 chub over 6lbs the previous day. I reflected on the fishing and decided to start very early today. The forecast was for very strong winds of 60mph and heavy rain from early morning. I was on the river at 7am thinkng that I would get a small window of opportunity on the river before it would rise and colour. I staggered across the field battling the strong wind. It was a southerly turning around to a northwest wind later in the day. The approach was exactly the same as the previous day. The willows on the far bank protected me from the full force of the wind. I was using 90g feeder again. First cast in I had some indication that there were a few chub in the swim judging by the plucks and pulls. My first fish of the day turned out to be a really good fish. The rod nodded a few times as the chub moved downstream bumping the feeder along the bottom. I lifted into the chub preventing it from getting into the branches on the far side. Again I played it very gingerly. As it moved downstream I followed it. Soon we were from the willows and had little protection and at times was unsure whether I was playing the chub or the strong wind. Not pleasant and scary. Luckily the size 18 hook held and I netted the chub about 6oyds below where I hooked it. It looked beautiful and rather large. On the scales it went 6lbs 10oz. I kept the chub in the net while Andy (you should have been here yesterday) Cowley was on his way to take the photo’s. My goodness it was pouring with rain and I was just standing there in my wet weather clothes being buffeted and pounded by the wind and rain. I could see the river start to colour as the rain started to leach into the river from the New Forest streams. The level started to rise. The chub were still feeding throughout the morning and into the afternoon. The rain poured until about 3pm then the wind changed direction and blew from the right making fishing uncomfortable. With the increase height and flow I could no longer hold the bottom with 90g and so had to concede even though the chub were still feeding. I had caught 4 chub which was a good result. 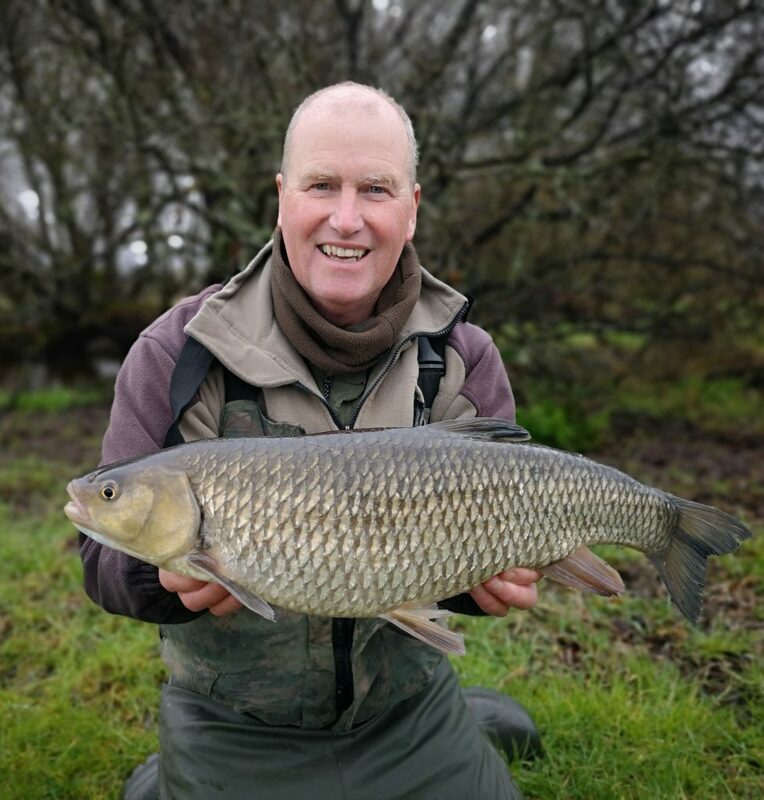 a 3lbs 15oz and two others at 4lb plus.Andy took the photo’s of the 6lbs 10oz chub and headed off pike fishing. 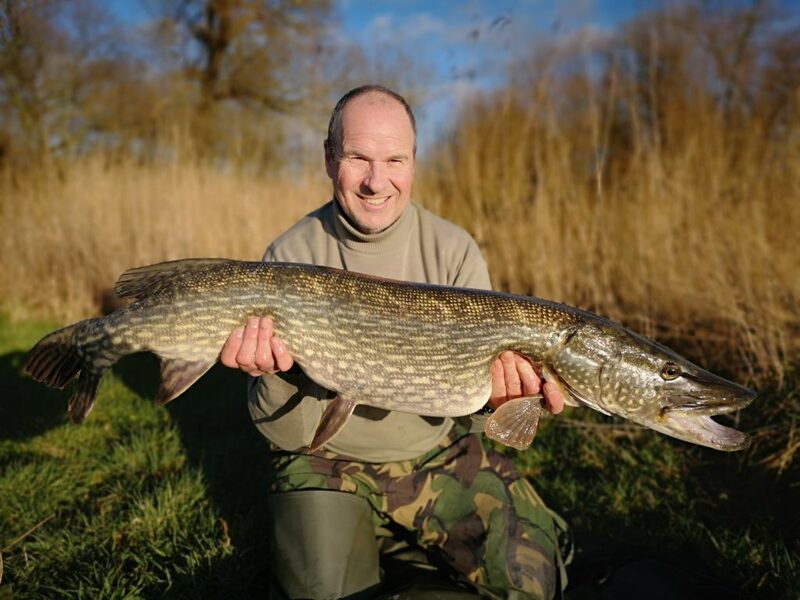 I was starting to think about packing up and moving when Ady called to say he had a 20lb 12oz pike so I said give me a few minutes I will be down to photo it for you. Andy carried on fishing and I moved to a couple of swims and caught nothing else and being cold I didn’t hang around for too long. Packing away with another 6lb chub was fan bloody tas tic. This entry was posted on Monday, March 18th, 2019 at 10:06 pm	and is filed under Uncategorized. You can follow any responses to this entry through the RSS 2.0 feed. Both comments and pings are currently closed.